SAVE MONEY ON YOUR ENERGY BILL WITH THE MOST VERSATILE SHADE ON THE MARKET TODAY! Honeycomb shades, also know as “cellular” shades, combine two or more layers of pleated fabric forming a “honeycomb” cell that traps air. These popular shades are great insulators and the most energy efficient shades on the market. The Shutter Guy will help you select the right honeycomb shade to not only complement your décor, but provide you with a product that is sure to save you money on your energy bill. 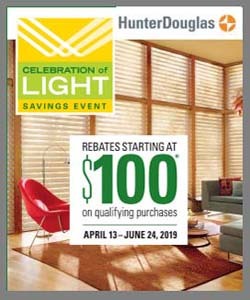 The Shutter Guy is an authorized Hunter Douglas dealer offers honeycomb shades from Hunter Douglas and other leading companies such as, Vista Products, Graber, Century Blinds, Horizons Window Fashions and EcoSmart, just to name a few. 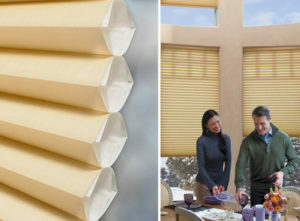 Shutter Guy offers a large selection of honeycomb shades in the Charleston, SC area. We also serve Goose Creek, Summerville, Isle of Palms, Sullivan’s Island, Folly Beach, Mt Pleasant, Mrytle Beach, Awendah, and surrounding areas. Click here to schedule an in-home consultation today!